Metrics: a custom solution for recording and displaying Key Performance Indicator (KPI) Metrics. 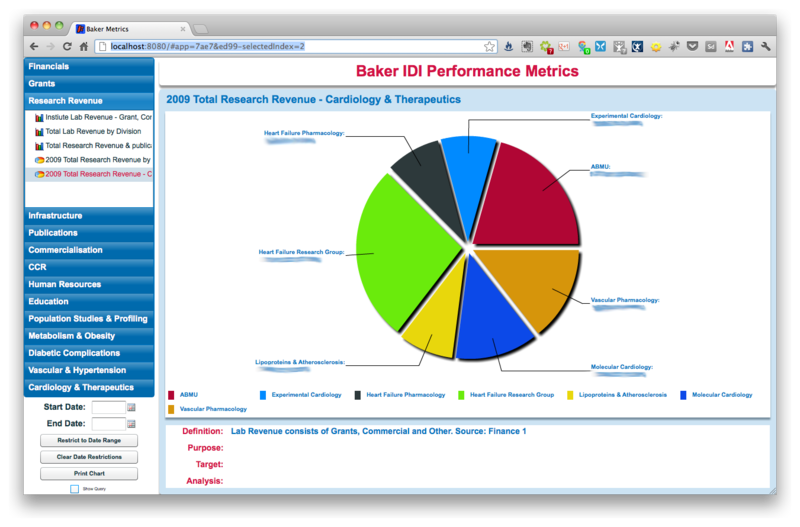 Developed in partnership with the Baker IDI Heart and Diabetes Institute, our Metrics program allows you to enter, collate and graph your performance metrics. The easy to use database allows you to quickly enter and collate your data, and to create sections and charts which are activated in real time in the Flex web front end. Charts load data from the backend in real time, meaning anyone looking at the graphical front end always has the most up-to-date version of the data. Custom metric creation allows your metric data to be graphed by a number of groupings without re-entering data. User defineable organisation structure allows easy breakdown of metric data by orginisational unit or time series. Dynamic filtering of data using our customised menu driven interface - restrict your data to a particular subset to better analyse your information. Graph data for a specific time period - date pickers in the dashboard allow "on the fly" restriction of the available data set to a specific time period. Data driven dashboard construction gives the user complete control over what sections appear, and what is contained within each section. Data holding - enter provisional scores and data, then release them for inclusion in the metric calculations once confirmed. Personalised access control – decide who gets access to which metric, graph or section.